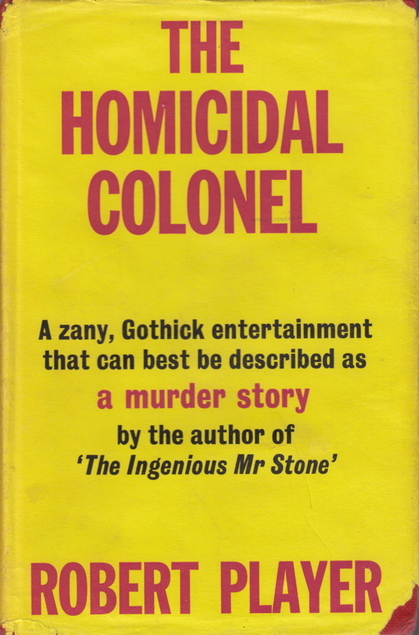 The Homicidal Colonel by Robert Player was first published in 1970 and my copy is a first edition Gollancz, I have no idea if it has been re-printed. It’s the first book I’ve read by the author and after I bought it I did question why I had bought a book – the title of which gives the murderer away, but it does work as crime fiction. This one begins in 1956 but it isn’t long before the story goes back to 1912 and the 21st birthday party of the eldest daughter of the Pangbourne family. They’re a dysfunctional bunch, used to the best things in life as there’s a lot of money in the family. One of them doesn’t see why he should have to share the money with his siblings in the future when their parents are dead. He aims to eliminate the others, but along the way he gets a real taste for murder and branches out. So although the reader always knows who the murderer is it’s interesting to discover how he’s tracked down and what made him tick. I quite enjoyed it. This entry was posted in Books and tagged Robert Player, The Homicidal Colonel, vintage crime by Katrina. Bookmark the permalink. This does sound very interesting. If I ever run across it I will definitely pick it up. Doesn’t look very easy to find though. I’ve never seen any more books by him, in fact I hadn’t heard of him before but I reckoned that it would be safe to buy it as it was published by Gollancz.